This University of Oklahoma hitch cover features a detailed, chrome plated "Sooner Schooner" with a black recess, mounted on a red hitch cover plate, and will look great on your truck. Hitch covers are a much classier and cleaner alternative to a bumper sticker. The quality is outstanding and there is no mess left behind. Made in the USA! Elektroplate produces the highest quality hitch covers on the market today. They are made of heavy gauge steel with a weather resistant coating. A glossy red finish is applied via a complex powder coating process to ensure durability in harsh outdoor environments. Guaranteed not to fade, chip, peel, rust or fall off. 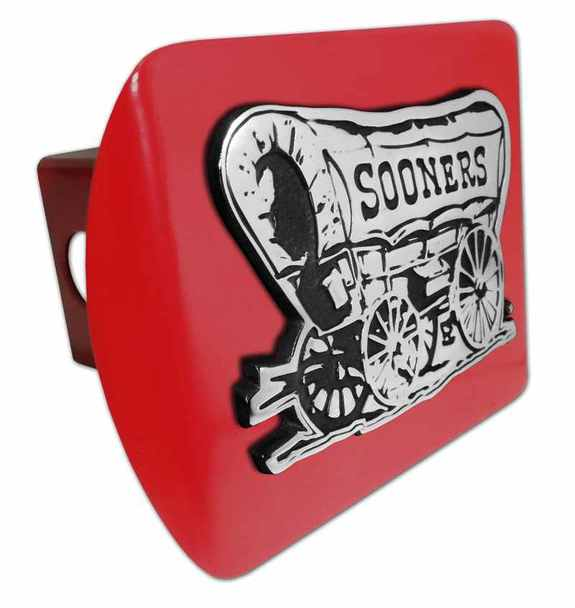 Our hitch covers also have a much better appearance than most others.